NAB2001 (National Association of Broadcasters) is the annual exhibition of converging electronic media communications. It showcases television broadcasting, video production, audio production, multimedia, Internet, satellite and telecommunications. No longer do live productions need to suffer from CG envy. 3DV Systems is demonstrating an innovative add-on to any pro video camera that can not only allow you cut-out even troublesome backgrounds from your subjects, its live z-buffer technology lets you insert CG characters and props right into live action video. 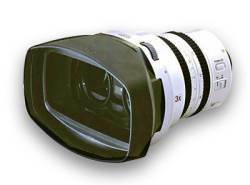 You attach the ZCAM between the lens and body of any color NTSC, PAL or HDTV camera. While filming as usual, the ZCAM emits pulses of infrared light and uses patented Parallel Range Sensing technology to generate a z-buffer or depth key mask for every frame. Because the device is self-illuminated, your lighting setups are unchanged. Likewise your set (or lack thereof) can accommodate the device unchanged with no blue screens in sight. Once you start rolling, the fun begins since you can "dial-in" the depth for your switchers to mask from the scene. Is the talent wearing a blue checked blazer in front of a blue plaid background? No problem. The ZCAM also has the potential to bring virtual sets alive since CG elements can be easily placed into a live scene in the foreground, background, or in-between overlapping live elements in the same shot, something impossible with traditional color keying. Beyond its ability to streamline studio setups and add new CG effects to live video production, 3DV's technology has the potential to break down the walls between synthetic and live content. It will be interesting to watch how ZCAM technology filters its way down into everything from full-body interactive video games to security cameras. If you need to add some more pizazz to your web site, Adobe has created two new "collections" of their software that can help. One is Adobe Digital Video Collection and the other is Adobe Streaming Media Collection. These collections help create a flexible workflow of tightly integrated products and the combination saves you money. Adobe Digital Video Collection combines Adobe Premiere 6.0, Adobe After Effects 5.0, Adobe Photoshop 6.0 and Adobe Illustrator 9.0. 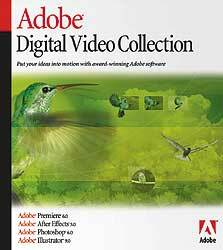 There are two versions of Adobe Digital Video Collection -- Standard and Production. The difference is due to the version of After Effects that is included. The Standard version is street priced at $1199 and the Production bundle is street priced at $1999. These prices represent a $1000 savings, when compared to the combined street prices of the component packages..
Each part of the collection has a specific purpose. Premiere 6.0 saves and edits the digital video content. Text, audio and effects can be added to these videos. Photoshop 6.0 performs image editing, color correction, animations and background creation. Adobe Illustrator 9.0 assists in the creation of artwork using its vector drawing tools and typographical controls. Special effect filters are common to Adobe Photoshop, Adobe Premiere, and Adobe After Effects. Bins, edits, and markers are preserved when importing Adobe Premiere projects into After Effects. Photoshop layers become editable objects when Photoshop files are opened in Illustrator. Each Photoshop layer imported into Adobe Premiere or After Effects can be manipulated independently. Photoshop vector masks, adjustment layers, and transfer modes can be used in After Effects. No matter how you intend to use your digital video, Adobe has created a comprehensive set of tools that helps you become more creative, streamlines your workflow and increases your productivity. With Adobe's Digital Video Collection, you don't have to learn and integrate packages from several different companies and now you can save money at the same time. If you need to add some more pizazz to your web site, Adobe has created two new "collections" of their software that can help. 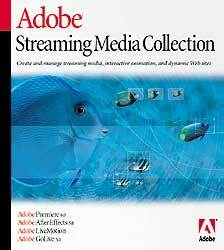 One is Adobe Streaming Media Collection and the other is Adobe Digital Video Collection. These collections help create a flexible workflow of tightly integrated products and the combination saves you money. Adobe Streaming Media Collection combines Adobe Premiere 6.0, Adobe After Effects 5.0 (Standard version), Adobe LiveMotion 1.0 and Adobe GoLive 5.0. This collection is street priced at $999, which represents a $750 savings, when compared to the combined street prices of the component packages. Adobe LiveMotion 1.0 helps you create user interface elements and other animations that incorporate motion graphics, sound and interactivity. Special effect filters are common to Adobe Premiere and Adobe After Effects. Web Markers inserted into Adobe Premiere and After Effects timelines can automatically launch HTML-referenced Web pages at precise points during streaming video playback. No matter how you intend to use your streaming media, Adobe has created a comprehensive set of tools that helps you become more creative, streamlines your workflow and increases your productivity. With Adobe's Streaming Media Collection, you don't have to learn and integrate packages from several different companies and now you can save money at the same time. Broadcasters have huge libraries of analog video archives. Finding material quickly and making changes for airtime is getting harder as programming becomes more "just in time". The RapidAccess MediaMachine from ASACA/Shibasoku Corporation helps solve these problems. The RapidAccess MediaMachine is a unique concept in MPEG-2 video storage and playback. It combines an ASACA TeraCart rewritable DVD Library with an embedded video server. By supporting direct analog/digital encoding and multistream decoding, the RapidAccess MediaMachine provides direct-to-air playback of up to 30,000 hours of video storage. That's nearly three and half years of continuous content available for quick retrieval. The ASACA/Shibasoku Corporation has created a solution that offers scalability and playback flexibility that is useful in applications such as sports venues, jumbotrons, amusement parks, theaters, museums and shopping channels, in addition to conventional broadcasting. Since the RapidAccess MediaMachine is built with a modular open architecture, it can be upgraded as needed. The embedded video server stores about 18 hours of on-line video, but optional 72 GB drives can be added to get 40 more hours of on-line video storage. 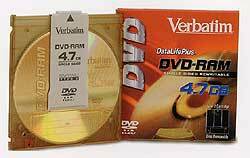 The DVD-RAM libraries of the RA-750DVD system provide about 1,900 hours of near-on-line capacity using 750 rewritable DVD discs. The RA-1450DVD system doubles this capacity. Using eight of these units, you can create a massive single library or multiple virtual libraries. For even greater capacity, expansion cabinets can be added that include up to 192 DVD-RAM drives with up to 11,600 double-sided DVD-RAM discs. This provides a whopping 109 terabytes (about 30,000 hours) of removable, rewritable video storage. Offers exceptional picture quality, instant access to individual frames and non-linear editing support. The RapidAccess MediaMachine RA-750DVD system starts at $136,900. The RA-1450DVD, with 6 drives, is approximately $231,800.00, depending on options. Options include Fibre Channel/SAN connectivity, embedded RAID and a Traffic/Billing interface. Dazzle is shipping the second version of its Digital Video Creator II (DVC II) hardware and software combo for capturing and producing DVD-quality videos. The compact hardware is no bigger than an external modem standing upright on your desk. But, there's a lot of audio and video smarts within that small footprint. For starters, the unit can sample and record mono or stereo audio at or near CD quality. Conversely, it can output edited audio to WAV or MPEG files. 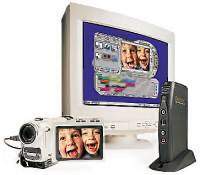 When it comes to video, the DVC II can grab hi-res stills (at near 2 megapixels resolution) or capture video (at better-than-VGA resolution) from composite or S-Video input at up to 30 frames per second (fps). Alternatively, you can set the DVC II to capture video frames at regular intervals, useful for security applications, time-lapse photography, or feeding Web cams. The included editing software makes cutting and mixing video and audio tracks together a drag-and-drop operation. You can preview your work at any time on an external monitor or TV and then go nuts adding digital transition effects and scrolling titles. Finally, you'll want to render your edited masterpieces directly to a VCR, the Web, CD-RW or DVD-RW disks in your choice of video formats; RealVideo®, MPEG-1, or MPEG-2. Whether you shoot techies in training videos or toddlers in training pants, Dazzle's Video Creator II appears to be a low-cost production tool bristling with the video gadgetry you need to tell your story. When capturing and working with digital video, you need high performance. A few years ago, some SCSI drives had video capability. Now LaCie pushes those limits, with drives that can transfer data at up to 45 MB per second. These external LaCie drives have up to 75 GB of capacity and can hold more 5 hours of DV video. They are hot-pluggable and easily connect to FireWire-equipped (1394) PCs and Macs. These drives double the data throughput performance of standard ATAPI (IDE) drives since they can stream data to the computer at a sustained rate of 35 MB/s (burst performance to 45 MB/s). are simple to install -- no need for terminators or device IDs - Sorry, external SCSI. The LaCie Fast FireWire hard drives are about $573 and are currently available. 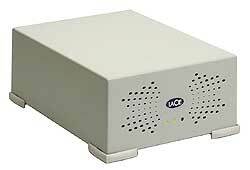 Included in the package are the 1394 cable and LaCie's Silverlining drive utility software for all the supported OSes (MacOS, Windows 98 SE and Windows 2000). Silverlining is the only driver able to manage USB, IDE, SCSI and FireWire peripherals at the same time. If you need this same level of performance in a more mobile package, LaCie offers the PocketDrive for mobile computing. With capacities ranging from 10 to 30 GB, these "pocket rocket" drives can interface to a laptop via either USB or FireWire. Need more hard drive space? Who doesn't? For anyone running a data center, adding a few more tower servers to get that extra storage can run you out of floor space in a hurry. The Maxtor MaxAttach is a more spatially efficient solution. In only 1.75 inches of rack space (1U size), you can have a 320 GB file server -- nearly a third of a terabyte! This server is also compatible with Windows, UNIX/Linux, Macintosh and NetWare users and takes only 10 minutes to install, without any network downtime. includes an integrated UPS for better fault tolerance. includes a three-year hardware warranty. The 160 GB Maxtor MaxAttach server configuration is $3,299 (without Gigabyte Ethernet) while the 320 GB MaxAttach server configuration is $4,999. Need even more space -- about a terabyte? Get three units. In only five and a quarter inches of rack space, you can now have 960 GB of storage -- much better than stacking towers around the data center. 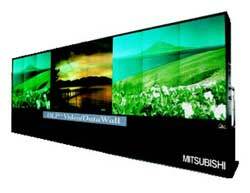 If you have the need for a huge display, Mitsubishi's latest large-scale product, the MegaView Wall, is what you need. By combining 50-inch display "cubes" with state-of-the-art controller technology, Mitsubishi creates an enormous video wall. 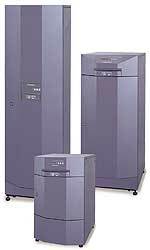 Specifically designed for power plant control rooms or retail security environments where a display is mission critical, these units can run non-stop, 24 hours a day. Each of the "cubes" has an XGA resolution (1024 x 768) and offer superior color reproduction. Each cube is color matched to the other cubes, through the use of a color calibration system. These individual cubes are "rear projection" devices and feature an ultra-short (26-inch depth), optical focusing system to save installation space. Their long-life lamps offer energy-efficient power consumption. Digital Micromirror Device (DMD) - This Mitsubishi designed monitor engine uses a DMD chip for display -- this is not conventional CRT technology. 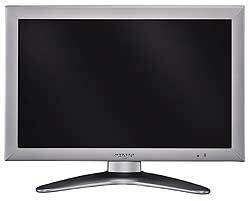 No burn-in - The DMD semiconductor is a reflective device and is not adversely affected when projecting a fixed pattern over a long period of time, like most CRT displays. Color calibration - Internal circuits compensate for color tone discrepancies between projection units, which provides consistent, outstanding color and brilliance uniformity. You wish you could go to the game, but it's halfway across the globe? You want to know if a specific chair is in stock at the furniture store? You need to see the daily status on your construction project four states away? All of these problems can be solved with Perceptual Robotics TrueLook technology and systems. If a TrueLook system was installed at the ball park, furniture store or construction site you would be able with a standard web browser, without any plug-ins, to look where you want at these locations. More than simply a fixed "Internet cam", the TrueLook system allows you to remotely pan, tilt and zoom camera at the remote location. You get to see what you want, when you want to see it. If a few more people decide that they want to go to the game, store or construction site, the TrueLook software automatically shares the camera. This gives you the feeling that you are the only person controlling your very own private camera. For crowds of people, TrueLook uses banks of cameras and software algorithms to cache, share and control the camera movement. Camera operators at games have only a single director telling them where aim, but TrueLook's robotic cameras could have hundreds of people shouting (via their browser screen) to look over "there". With each "there" being a different location for each viewer, the TrueLook software gives each viewer their own private image and optimally handles all the requests. Editor's note: We first met with Perceptual Robotics at the 1998 Digital Frontier Conference at the J.L. Kellogg Graduate School of Management at Northwestern University. I spoke with Kevin Convery from their Sales and Marketing department -- he is now their Vice President of Sales. See the pictures. If recordable CD-ROMs don't have enough capacity for you, Pioneer has a recordable DVD drive that also can record CDs as well. The Pioneer model DVR-A03 is a combination of a recordable DVD drive and a recordable/rewritable CD drive in one. This is the world's first drive that can perform all these functions in a single drive. The DVR-A03 will ship by the end of May 2001 and will have a suggested price of $995. Now you can store a whopping 4.7 gigabytes of data on a single, removable media -- that's over seven conventional CDs in storage capacity. This drive is primarily targeted for digital video recording and data archiving applications, but I can see some avid digital photographers using this drive as well. Kodak's latest six megapixel camera and sixteen megapixel DCS Pro Back makes conventional CD-ROM capacities look puny. In case this drive sounds familiar, Reviews OnLine covered the OEM version of the drive, before it even had a part number. That drive (now numbered DVR-103) is currently available in the Compaq Presario 7000 and PowerMac G4 systems. Now it is available to anyone by the end of May 2001 for under a thousand dollars. 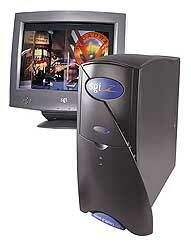 Silicon Graphics introduced its Windows-based visual workstation for high-quality virtual sets, virtual characters, and real-time graphics applications. This dual Pentium media workhorse comes in a tower or rack-mount configuration and is optimized for seamless merging of computer graphics and live video, in real-time. The Zx10 achieves this harmonious convergence thanks to high-quality conversion between YCrCb and RGB colorspaces along with configurable gamma correction. In addition, the workstation can genlock to your choice of an external reference, internal reference, or input video signal. Combined with a full sample rate Alpha channel and multisampled, scene-based anti-aliasing of CG elements, these advanced feature are designed to eliminate compositing artifacts and produce clean, broadcast-ready standard definition (SD) video. While many companies tout the recordable DVD as the digital format for consumers to store their own videos, TeraOptix has created the Terapin CD Video recorder that uses more conventional and lower cost recording technology. 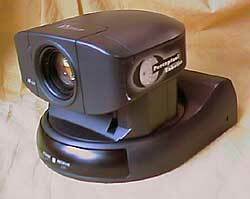 For about 600 dollars, you are now able to record any video source directly to CD-R media. Now it is quite inexpensive to record a TV program you missed, since some generic CD-R media is only thirty cents each. Considering a bulk pack of fifty CDs takes up far less space than the equivalent VHS tape volume, finding that program again should also be much faster. While there are plenty of ways to digitize video on your PC, the Terapin CD Video recorder doesn’t require any computer expertise or even a computer to operate - it’s self contained. It behaves just like a conventional VCR, except you insert round CD media instead of a tape. 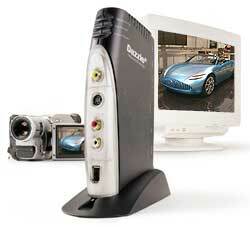 Playback is accomplished through this device, as well as CD video players, DVD players and a multimedia PC. It also comes with a remote (see below). Now that I look over the product specs and features, I have to wonder why more companies haven’t created one of these - a simple, easy to use, digital video recorder, using inexpensive rigid media instead of tape. requires NO MORE REWINDING! This feature alone almost make this CD Video recorder worth it and no more jammed or broken tapes either. can play directly from a specific time location on the CD disk. You no longer have to wait while you fast forward or rewind to arrive at the desired scene - you can just “skip” directly to it. While DVD has this feature, you now have this capability for your OWN content. Instead of having to wait to access a particular scene in the video of your son or daughter’s birthday, graduation or wedding, you can simply “skip” to it. And unlike tape, you won’t wear out the CD media as you play it for friends and neighbors that drop by. has video inputs and outputs for S-Video and Composite video. 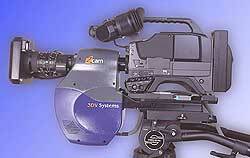 Representative video sources include camcorders, television broadcasts, VCRs, DVD players and cable set top boxes. has stereo inputs for optical, coaxial and analog audio. Representative audio sources include CD players, PCs, DAT devices, DVD players, tuners, tape decks and phonographs. Audio outputs include coaxial and analog. is available in 3 colors (Raven Grey, Lava Red and Ice Blue). My favorite color - Ice Blue - is shown above and below. includes a remote control that matches the device.